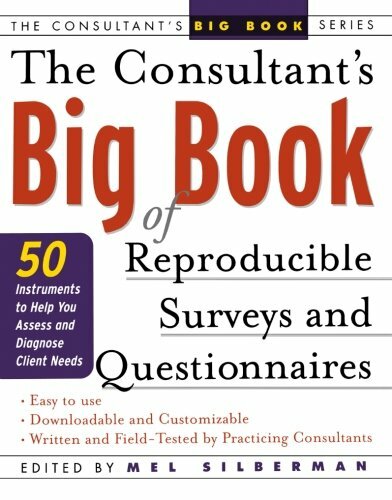 The Consultant's Big Book of Reproducible Surveys and Questionnaires is a value-packed collection of 50 easy-to-use diagnostic tools consultants can use to collect data from their clients, quickly make needs assessments, and offer diagnoses. Never before has such a comprehensive, user-friendly collection of surveys and questionnaires been available to consultants. Mel Silberman, Ph.D., is a bestselling author, speaker, and consulting psychologist known internationally as a pioneer in the areas of interpersonal intelligence, active learning, and facilitation/ consultation. Dr. Silberman is the president of Active Training, a provider of products, seminars, and publications.